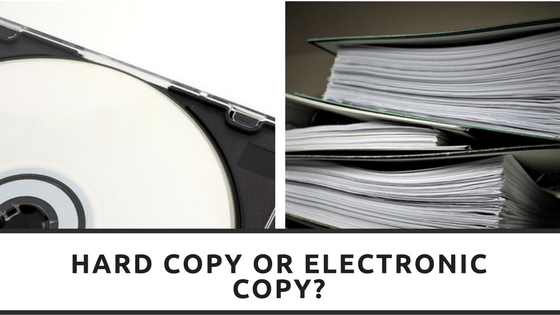 Hard Copy or Electronic Copy?? There was a time when all business documents were paper copies, some even little scraps of paper with IOU’s and promises between business friends. Meetings required travel, so sometimes a simple 1 hour meeting could take hours. Now though with technology moving forward you no longer have to travel to take care of business, telephone conferences and e-mails make it far easier to communicate for meetings, data is easily e-mailed across and downloaded into processing systems, less and less physical money is exchanged. Sometimes you never even see the person you’re doing business with, you transfer money and you receive your item. Many job roles require you to have some sort of IT qualification or provide proof of your understanding regarding IT process showing exactly how far the technology world has come. For the new generation of workers this is normal and nothing unusual about it but being one of those workers who used to sit with piles of paper with data that need hand inputting on a daily basis I find that I am always double checking the computers work and I do miss the feel of paper in my hand when transferring data. Even today I have printed out a Client Information sheet to copy type the information in to each of our systems rather than rely on the computer, I feel more in touch with my business when I can be that little bit more hands on. True when the amount of data that requires transferring is large it is easier to just use the computer processes to copy the information but I do like slipping back in to the old ways every now and again. Flicking through screens on a computer and trying to see everything at once like you would with paper spread out on a table irritates me, I find at times I would need 3-4 screens just to see all the data especially when comparing the data on several spreadsheets. RedRite is a small business and we take care of all aspects of the business from starting up customer service, finance and marketing so we have to ‘see’ everything at once I can only image how many screens the bigger companies require their employees to ‘see’ at once. So what kind of worker are you? A lover of hard copy paperwork and a table full of paper or electronic worker, who prefers to flick through screen after screen of data and place their trust in the computer systems? Please let us know, we love to hear from our readers.